Seventy-five (75) medals have been awarded at the ten (10) World Ultimate Club Championship events since 1989. There have been club teams from 7 different countries that have ever won a WUCC medal. USA club ultimate teams have swept WUCC medals 13 times (6 in the men's division, 2 in mixed, and 5 in the women's division). Japan is the only other country to have swept a division - women's division at 2006 WUCC. Gold: Club teams from 3 different countries have won gold at WUCC. Silver: Club teams from 5 different countries have won silver at WUCC. Bronze: Club teams from 6 different countries have won bronze at WUCC. Previous events hosted in the United States - in 1993 and in 2002 - were swept by club teams from the USA. 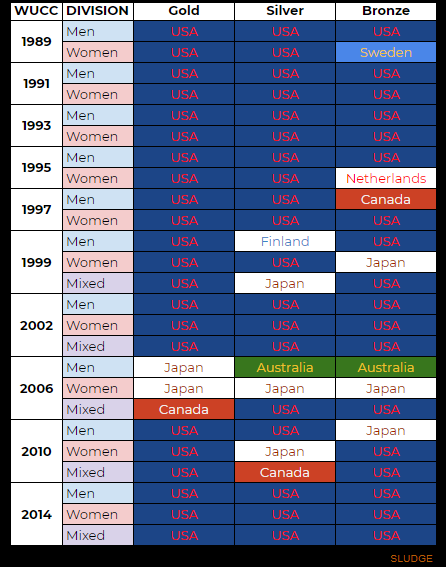 Club teams from the USA won gold at the inaugural WUCC event in men's and women's divisions (1989) and gold when the mixed division was introduced (1999). Further, club teams from the USA won gold at the last WUCC event in 2014. Silver: Club teams from 5 different countries have won gold at WUCC. Bronze: Club teams from 6 different countries have won gold at WUCC. I think the last two should be "silver at WUCC" and "bronze at WUCC". Thanks for reading, Jacob. Text has been updated accordingly.